Eating a light dinner in good company? You must be a member of the Brussels Midweek-Mixer Group to attend this activity. Would you like to join this group? 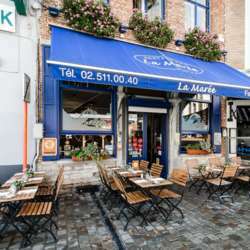 For fish and sea food lovers, after the food extravaganzas of December, join me for a “leaner dinner” at one of Brussels we’ll known and traditional “poissonnerie” on rue de Flandres. Michelin Guide describes Protected content as an “authentic Brussels bistrot where fresh products take pride of place”.